The summer’s over, and here we are again! We hope you had as great a summer as we did. After glorious days packed with cool drinks, juicy barbecued steaks and refreshing dips in the lake, a golden autumn is on its way. But as the season cools down, things are hotting up at KLOTZ. Our StraightLink EcoLine Stage Boxes now have a few additions to the family - they’re now available in 6/2 and 10/2 models, ideal for use as sub-distributors for small-scale acoustic sets or sub-multicores for miking up drumkits. Michael Elsner is a classic side man – a behind-the-scenes musician, active as a guitarist, composer and producer. And as if that wasn’t enough, he records guitars in his studio for sound libraries, writes articles and columns for Internet guitar sites, has published a guitar tutor and even finds the time to give online tuition on a guitar website. KLOTZ Cables make child’s play out of this marathon work calendar. M2, a top-class microphone cable - with superb shielding, capacitance of only 60 pF/m and a flexible and highly durable jacket. Ultra-neutral sound and rugged design that handles touring with ease – professional through and through! Another big success at the KLOTZ factory tour followed by a cozy BBQ! Thank you for your participation and lively interest! We are looking forward to the next years factory tour! It has been a lot of work lately in our Fiber Optic department. Obvious favourites have been our four times DVI extender EXTDK12SD4, all together with the matching Fiber Optic SmartBeam drums F4UG11G250. 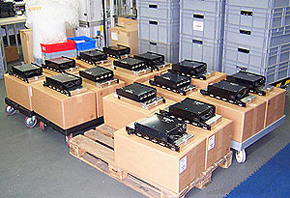 As the products were needed right on time, we managed to take some pictures just before the extenders were packed up, as were the drums earlier, and together the systems are now on their way to our customers, where their duty is to send high-definition video signals over a long way, and they will do that without any hum or fuzz! Anyone born in Woodstock/NY would pretty much have to be in the music scene. And that’s exactly how it is with Michael Elsner. He’s a classic side man, the musician behind the scenes – as guitarist, producer and composer. Elsner has featured in numerous film scores including “Ella Enchanted”, “Young Adult”, “Thank You for Smoking”, “Sundays at Tiffany’s” and “Fairly Legal”, to say nothing of TV shows such as “The Young and the Restless”, “The Ex List”, “Growing Up Fisher” and “Dig”. Elsner composes for films and video games for his own production company, Sonic Tremor. And as if that wasn’t enough, he records guitars in his studio for sound libraries, writes articles and columns for Internet guitar sites and for “Collectible Guitar” magazine, and even found the time to publish a guitar tutor and give online tuition on a guitar website. So he needs cables that can handle his packed schedule without a murmur. And he found them at KLOTZ. 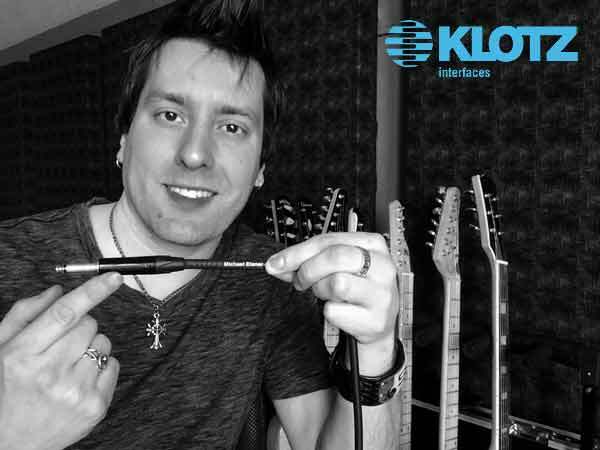 Michael Elsner uses TITANIUM, LaGrange, RockMaster and M5. This is particularly true for loudspeaker cables. The chart below shows how much power gets lost “on the way” depending on the conductor cross section. So never save on conductor cross section if you need maximum performance! Our recommendation for the rental / touring sector: Loudspeaker cables with 4mm² conductor cross section, e.g. our L44PSMF cables with NLT4 metal connectors and PUR outer jacket. The popular StraightLink EcoLine series has been extended! The popular StraightLink EcoLine is growing. In addition to the existing 8/0, 8/4, 12/0, 12/4, 16/0 models (inputs: XLR 3-pin female/outputs XLR 3-pin male), the family now features a model with 6 inputs and 2 outputs, e.g. as subdivision for small acoustic line-ups (cajon low, cajon high, guitar 1, guitar 2, voc 1, voc 2) with left and right PA returns, and a model with 10 inputs and 2 outputs, for use as e.g. drumkit subdivision (kick in, kick out, snare top, snare bottom, hi-hat, tom 1-3, overhead left and right) plus stereo return for in-ear monitoring. 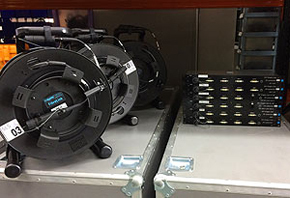 The new additions ensure that every instrument combination has the right multicore, in standard lengths of 10, 15 and 20 m. StraightLink EcoLine Stage Boxes bring order to stage line-ups without breaking musicians‘ often limited budget – even though the entire series is Made in Germany. The M2 Microphone Cable has all the features of a top-class product: superb shielding, capacitance of only 60 pF/m and a flexible and highly durable jacket. The basis for this professional microphone cable is our MC2000 Cable, with PVC jacket and 30 mm bending radius. A spiral shield protects against external interference. With an extremely generous external diameter of almost 7 mm, superb fidelity and Neutrik connectors, the M2 is equal to whatever life on the road brings along. A pro cable through and through! You will find our huge product selection in our ePaper catalogues, frequently updated! Or go and get our latest android or apple App with and browse easy through our products!